Online Graphic Tricks for Photo Editing, Graphic Design and Photo Collage ~ Visualistan '+g+"
Have you ever be bothered by how to collect your photos in a perfect way? 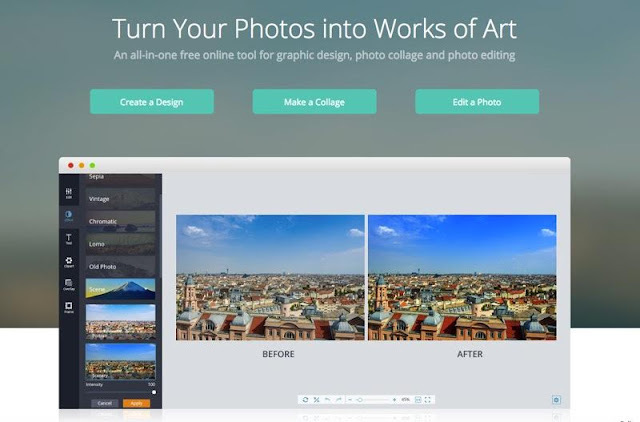 Do you hope to find a tool to help you edit photos easily? Or are you eager to create some amazing banners for your blog, website and social media accounts? If you are any one of them, now you will be happy to learn one of the best graphic tools that can help you to arrange photos creatively. I must recommend FotoJet, an all-in- one graphic tool for photo editing, graphic design and photo collage. This is an online tool, so you have no trouble to download it but are free to use some basic features in any browser. FotoJet can be applied effective anytime, and it is very easy and practice one for you to try. Sometimes, we may fail to take our photos well, so finding a helpful tool is important. The FotoJet editor allows you to make photo adjustments with basic and advanced options. You can change the size, angles and so on of your photos, and what’s more you can focus and highlight the certain parts you want with your photos. At the same time, you can add effects, overlays and frames to make your photos stand out from the crowd. There are plenty of beautiful resources built in, and I believe you can definitely find ones you like. Under design mode, you can make many professionally designed banners for your social media and blog, such as Facebook Cover, Poster, Flyer, YouTube Channel Art and so on. You can directly use the premade templates or create one from a custom size. All the templates here are well designed with suitable images, text, clipart and some other elements. Therefore, you just need to make some minor adjustments; you will get a satisfying design. If you want to be more creative and unique, choose a custom size and add images, texts, stickers and other elements on the canvas. FotoJet is so easy and intuitive that you can have a wonderful design with simple clicks. 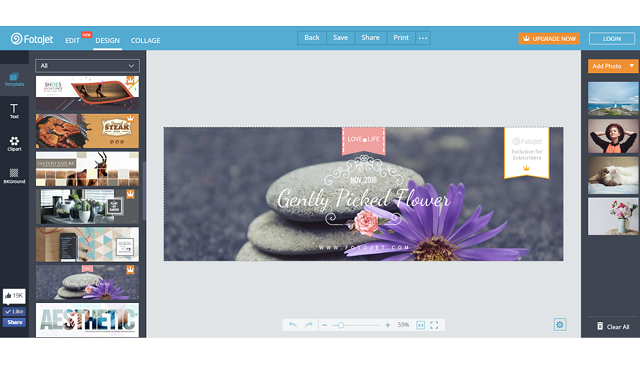 Collage maker is the basic function of plenty of online graphic tools, but what make FotoJet different is that it gives you more choices and it can be much easier to create your unique and amazing collages. 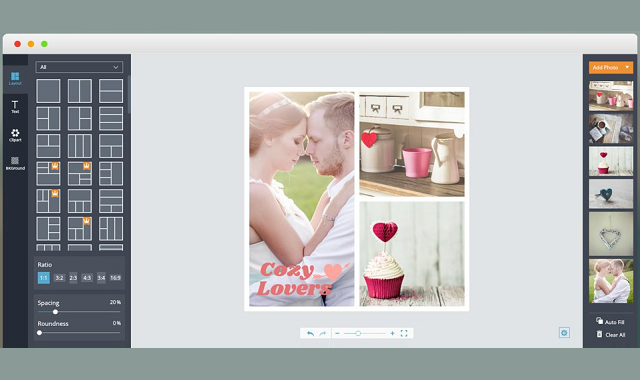 FotoJet collage maker provides you with a large number of classic templates and creative templates, you can have a quick preview of all the templates before you start and you may more likely to get the templates you like best. 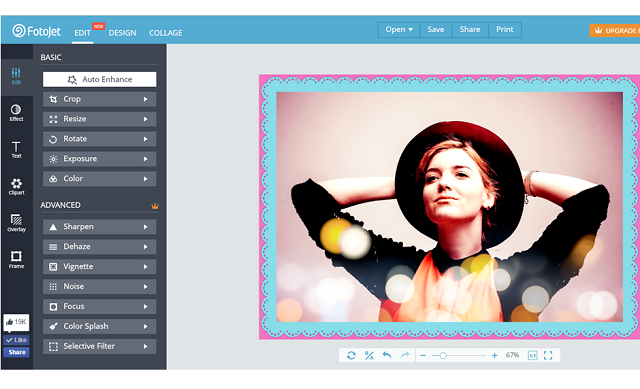 Just choose a template; upload your photos; add text, clipart and some other elements. 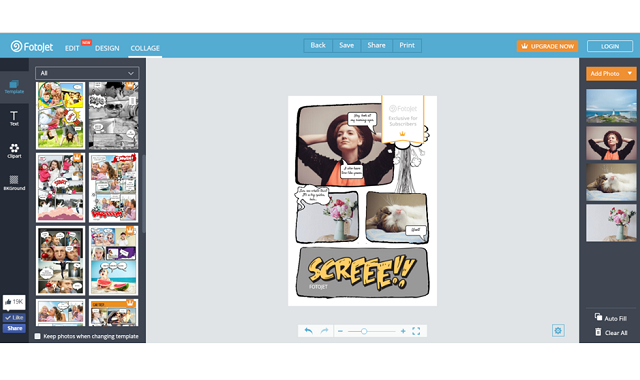 After all adjustments are done, you can save, print or share your collages online. At the same time, you are allowed to make comics, fun photos, magazine covers and some holiday cards. Have you found any of them useful for you? If you’re interested, do not hesitate and just try FotoJet out.